Our resident plant expert, Phil McCann, shares his top tips as you head out into the garden this March. March is a busy month and this year we have the added interest of both Mother’s Day and the first part of the Easter weekend. It’s also a month of cold, wet, warmth, sun and wind. And maybe snow and probably frost. 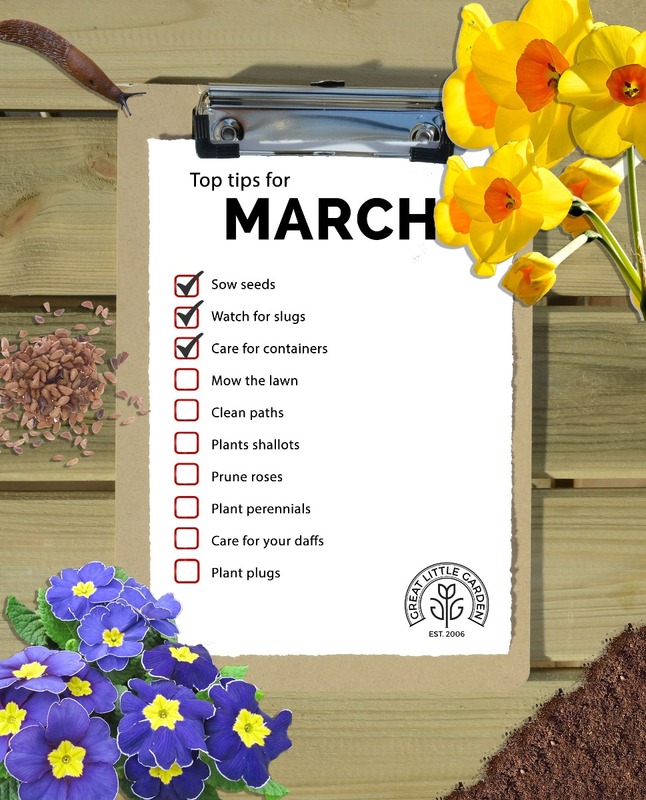 But to be honest, with a little protection and preparation, many of those gardening jobs you can't wait to get cracking on to can actually be started. March is a fun month and also the start of British Summer Time. So, what are you waiting for? Go and get gardening. I know, it’s rather an all-encompassing statement but so many seeds can be sown now. Read each packet carefully and stick to the advice. Years of research has gone into the development of each variety and the seed merchants know best. One quick tip though - if sowing directly outdoors do warm the soil up with cloches, black polythene or any covering for a week or so before ripping the packets open. It will warm the soil making it more hospitable for seeds and it will encourage weeds to grow - and you can pull them out before your seeds go in. It’s been a few months since I last went on about slugs but tasty new shoots and warmer weather add up to slug-time! Choose your method of control or deterrent and stick with it. Chemicals are available, with all the raging debate, but there are other ‘free’ ways to deter the gardener’s number one pest. Try coffee grounds from your local cafe. Spread them around susceptible plants; they are said to deter slugs. Scooped out, upturned oranges and grapefruit attract slugs away from your prized plants while encouraging wild birds into the garden will eventually result in a balanced ecosystem. Let us know your favourite and most effective method of control. Containers need a bit of a perk up now that March is here. Shrubs growing in containers can become hungry so scrape off the top centimetre or two of compost and replace with new. This gets rid of weeds, breaks up any solid surfaces and adds a little bit of nutrience. It also looks better. If your containers are empty then give them a good clean, checking the undersides for any slugs and snails, and dry them off in readiness for all your bedding plants. As temperatures rise above 6C, your lawn will grow. The earliest cuts need to be on a high setting. In other words, just a tidy up, a little off the top and no scalping. A high cut will help the lawn produce strong growth. Obviously, this is with a clean and sharp mower - freshly serviced a month or so ago in readiness for the big mow. Alternatively, rush your mower in for a service or change any blades before embarking on the rest of the mowing year. Pathways are slippery with moss after the long, wet winter. A pressure washer will spruce them up. Buy one and share the cost with neighbours (you probably won’t be using it every week) unless you love a sparkly car. Take your time, do it right, cover windows and patio doors to avoid splashing and only do it when the forecasters aren't expecting frost. You may need to check your pointing and re-sand after a thorough jet washing session. Shallots must be one of the easiest veg to grow. Pop a set in, wait a few months and harvest six or eight more. They’re tough little things thriving in well-drained soil and a sunny spot. Plant them now to harvest in July / August. Basics of pruning include getting rid of dead and diseased branches; anything that is weak and spindly; a branch growing up against another branch. Rubbing of branches = possibility of infection. And wear gloves. Always use clean, sharp secateurs or loppers. Aim for an open-centred plant with no branches or buds growing into the middle of the plant. This results in great air movement and a healthier rose. For newly planted roses you need to prune hard. This will encourage plenty of fresh, strong shoots. Perennials are plants that grow, flower, die back and then come back and do the same again, year after year. You might hear them called herbaceous. Now is the perfect time to plant them. They aren’t in full growth yet so knocking them out of their pots and putting into the soil won’t harm them or cause any surprises. Plant up to the same level they were growing in in the pots and dust the roots with mycorrhizal fungi before planting. It will get them off to a flying start. By the end of the month some daffodils are beginning to fade. If you want good blooms next year, it’s best to nip off the fading flowers and do nothing to the leaves. Leave them to sprawl. This allows lots of food to be put back into the bulbs and that equals next year’s blooms! So, don’t tie them up, or even worse, cut them off. If you left the flowers on, the plants seeds will form and that mops up a lot of the plant's energy. It is way too early to plant bedding plants outdoors - they would last a week at the most due to cold temperatures - but it is time to pot them up in the cosy confines of a warm greenhouse. Plug plants are merely baby plants. Give them a good soaking before putting them into small pots of quality multipurpose compost. Grow them on, pot up if they get big and plant out into their final flowering positions once any danger of frost has gone.